A number of companies have already applied for benefits offered by the National Hydrocarbons Agency (ANH) thorough the Agreement 02, and the entity’s president Mauricio de la Mora says another round of measures are being planned. Pacific Rubiales (TSX:PRE) and Ecopetrol (NYSE:EC) are the only Colombia focused operators participating in the historic bidding round that will open the Mexican oil industry to private capital, which has advanced to the next stage. Last week reports of missing hard drives at the National Hydrocarbons Agency (ANH) with data on offshore blocks caught the attention of the local press. However probably a bigger story was on falsified bank guarantees for ANH contracts, conveniently slipped into the same press release. Now more details emerge on this latter issue. Finally ruling on one of the more controversial and uncertain scenarios facing the Colombian oil industry, Ecoeptrol (NYSE:EC) has said it would not renew its association contract with Pacific Rubiales (TSX:PRE) for Colombia’s largest producing field, Rubiales. For the next Colombia Round, the Colombian Society of Geology says the National Hydrocarbons Agency (ANH) should auction blocks with pre-approved environmental licenses, in order to lessen the potential impact of a process that has become one of the greater obstacles towards exploration and production in the country. The Ministry of Mines and Energy (MinMinas) will meet this week with representatives of coal miners Cerrejón and Drummond, as well as Ecopetrol (NYSE:EC) to discuss Coal Bed Methane (CBM) that has been the center of conflict between the two coal miners over an unclear concession. Brazilian oil operator Óleo e Gás Participações (OGX) says that social and environmental issues pushed it to divest its Colombia assets in the Cesar Rancheria (CR) and Lower Magdalena (VIM) basins, and continues negotiating with the National Hydrocarbons Agency to reach an final exit plan. Texas based oil operator Anadarko (NYSE:APC) walked away with three of the five offshore blocks assigned in the Colombia Round 2014, and has caught the attention of authorities after offering the largest amount for a single block, at US$123M. The National Hydrocarbons Agency (ANH) is pushing to have the reference terms ready in three weeks for the second phase of the Colombia Round 2014, which will look to award the 69 blocks that did not reserve a bid last week in the opening phase. The 2014 Round of auctions is over and the Colombian government is all smiles (at least in public) with 26 of 95 blocks assigned. 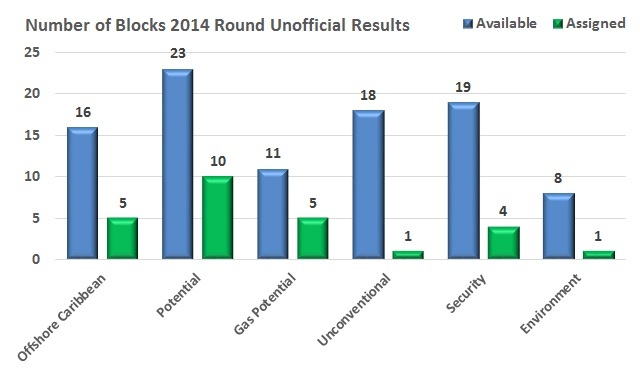 Unlike the previous round, all the onshore winners are companies already doing business in Colombia.